Nope, we're not going to hit version 1.0 yet :) Let's go to version 0.10. Ink version 0.8.2 which includes new built in functions (LIST_RANDOM, FLOOR, POW, and more), as well as lots of fixes and minor improvements. And new for Inky: a new web template, including support for dark theme, images and more! # IMAGE: pathToImage to insert images. # CLEAR to start a "new page", clearing the existing text on screen. # RESTART to restart the story from the beginning, also clearing the screen and player progress. We suggest you do this after a + Restart choice! # CLASS: className: Built in tag that will apply a CSS class to a line of content. Built-in .end CSS class that you can apply to "The End" text if desired. Fix for scrolling behaviour with large amounts of content so it doesn't scroll too far. Fixes for layout when embedded in an iframe, such as when uploaded to itch.io. Fix for the titlebar not updating from "Untitled.ink" when saving new files on Windows. Fix for CTRL-P shortcut for "Go to anything..." not working on Windows. Minor version Inky that has a fix for certain ink files not loading if they were saved on Windows with certain editors that insert a byte order mark at the start of the file. This version of Inky contains version 0.8.1 of ink that also has some extra fixes not included in the official 0.8.1 ink release. Version 0.9.1 of Inky includes ink version 0.8.1, a minor update version of 0.8.0, which was a ink major release. 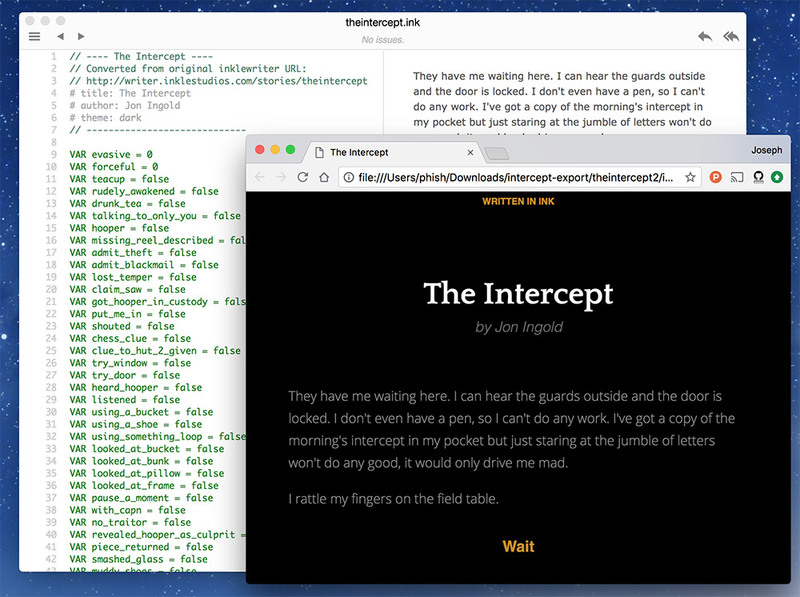 When exporting to web and to story.js only, inky will export using a version of ink that is known to be compatible with inkjs (currently v0.7.5 with hot fixes), which is essential for the story to function. Previously the export for web feature would be disabled until inkjs had a change to catch up. However, this does mean that you may be surprised if the web version of an ink story behaves very slightly different to the inky or Unity-based version (which is equivalent to the JSON export option in Inky). Goto anything is now much more responsive. Bug fixes, thanks for everyone who contributed! This build of Inky includes ink version 0.8.0, a major new release. It can also go to a line number in the current file - just type in a number into the search box. Big thanks to @arashikou for his work on this feature! He's built a custom completer that intelligently produces context specific typing suggestions as you type. For example, if you type -> and start typing, it'll suggest divert targets. And when you're in a normal writing context, it'll suggest vocabulary based on what you've typed before. It can also suggest ink-specific keywords. ink upgraded to 0.7.4 (see latest updates from 0.7.3 and 0.7.4. Latest versions of ink (0.7.2) and inkjs (1.5.2). Web export functionality restored, thanks to @y-lohse's great work on inkjs, bringing in lists support. Fix for alt-clicking divert targets in order to jump to definition. Fix to allow TODO items to contain quote marks. 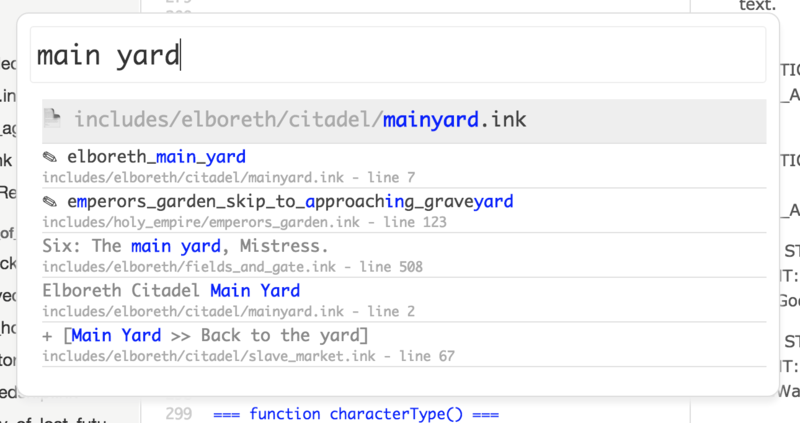 This version brings support for a brand new powerful ink feature - Lists - see the documentation. WARNING: This version temporarily breaks Export for Web functionality, until inkjs catches up with the lists support, which is a large new feature. If you don't need lists, please continue to use inky version 0.6.4. Update to ink 0.6.4, which brings an optimisation for when you do a long calculation after a line of content, and forces choices to always come after content, even if you do sneaky things with threads that would otherwise cause them to be interleaved. 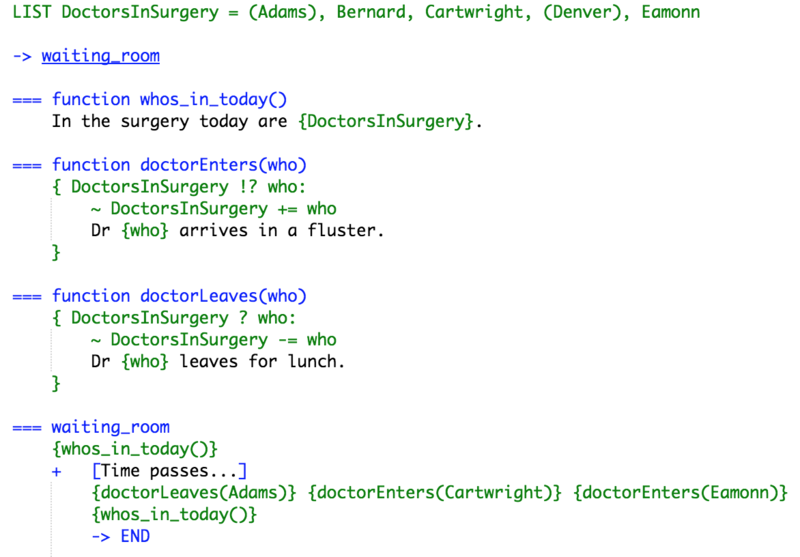 Fix for syntax highlighting TODOs. Update to ink version 0.6.3 (and inkjs version 1.4.3), which brings a few bug fixes, including mismatched left/right glue, crashing when using tags in choices, comparisons of divert target with other expression types, and -> END not properly ending in some cases.